HILLSBORO — The Sandy girls basketball team played tug-of-war with Sunset in the first quarter before losing its grip and falling 47-25 to the Apollos in its first game of the Century High holiday tournament last week. 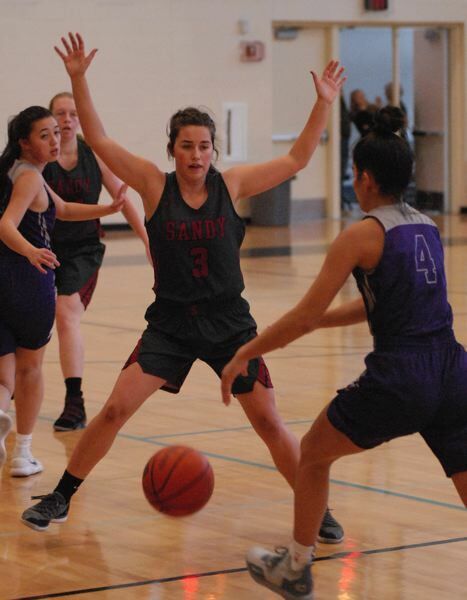 Sandy's Brooklyn Adams leapt out at a Sunset shooter and blocked a shot on the perimeter, and the action flowed the other way with teammate Athena Thomas earning a trip to the free-throw line. She sank both of her shots to put the Pioneers on top 6-3 in the early stages of play. A few minutes later, Sunset came up with a loose ball under the Sandy basket, but only got a couple dribbles down the floor when Bella Kansala swiped the ball back and went directly to the hoop for a layup. The quick change of fortune put the Pioneers on top for the final time at 10-9, as the lead changed hands seven times in the first quarter. Sunset's Mikaela Byrnes knocked down a 3 from the right side, the first deep ball of the game, to give the Apollos a 14-10 lead at the end of the quarter. Sunset's Vanessa Lopez hit another trey to open the second period, and the Apollos were off and running. Sunset would put together a 17-1 spurt before Sandy scored its first bucket of the period when Morgan Maul found Kansala cutting through the lane for a layup with 2:08 left in the half. Maul got into the scoring column herself by aggressively hitting the boards, squeezing past a defender along the baseline and converting a third-chance bucket that brought the Pioneers within 10. Sandy had several possessions to pull even closer before halftime, but came up empty on the offensive end. After seeing a Pioneers' pass trickle out of bounds in the corner, Sunset traveled the length of the court in a few seconds, and Lopez beat the horn with a corner 3 — her third long ball of the half — to send the Apollos to the locker room in charge 29-16. The Pioneers were held to two field goals in the second half, as Sunset quickly expanded its margin past 20 points. • Sandy dropped a 39-35 overtime game to Wilson leading up to Christmas. Kansala finished with a team-high 15 points, scoring all but one of her buckets in the second half. 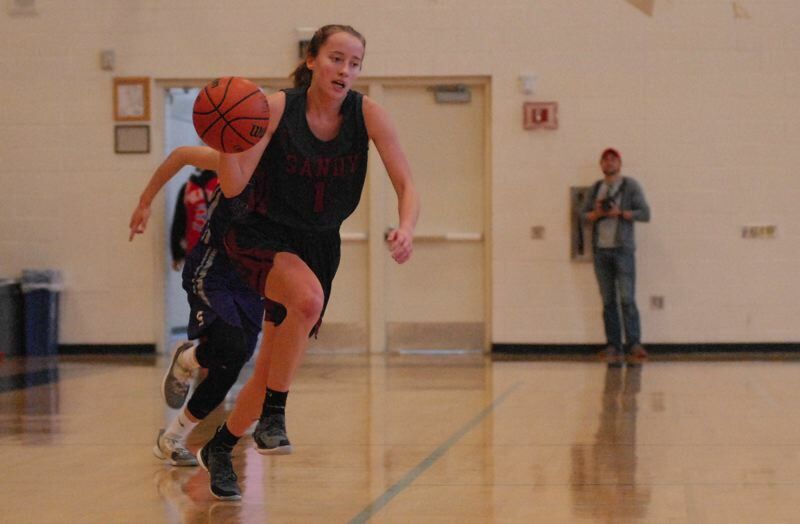 Sandy opens the Mount Hood Conference season with a boys/girls doubleheader beginning at 6 p.m. Friday at Clackamas. Sandy (25) — Bella Kansala 6, Athena Thomas 5, Tana Dwyre 4, Morgan Maul 4, Jackie McCrea 3, Paige Dobson 2, Brooklyn Adams 1, Turin, Dukart, McNutt. Sunset (47) — Vanessa Lopez 15, Haley Bennett 9, Grace Kimball 8, Jillian Jang 8, Mikaela Byrnes 5, Parris Stark 2, Samuelson, Dobson, Gonzalez, Penn. 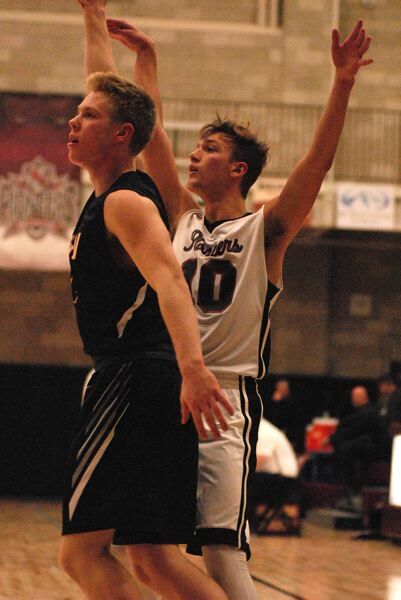 The Sandy boys basketball team scored a 61-52 win over Liberty in 'The Eight' tournament — a pre-holiday tournament leading into the Les Schwab Invitational. Pierce Roeder and Kaleb Hubbard shared the scoring load with 16 points apiece, while Danny Classen finished with 11 points and three blocked shots. The Pioneers hit 6 of 12 (.500) from 3-point range in the first half to build a 32-27 lead. Sandy dropped a 73-70 decision to DeLaSalle North in the consolation finale, as the Knights put up 27 third-quarter points to power their comeback. Roeder led the Pioneers with 26 points on 5 of 9 (.555) shooting from 3-point range. Sandy opened with a 72-59 loss to Pacifica Christian out of California. The Pioneers got out to a 19-14 first-quarter lead before seeing Pacifica charge in front in the third quarter. Roeder led Sandy with 17 points, while Colton Gorski added 13. This package of basketball stories is slated for our Jan. 2, print edition.